Wood destroying fungi, commonly misnomered "dryrot" (since it takes moisture to cause the fungi to grow), is the only wood destroying pest in our part of the world that is plant life and not animal. Yet, wood destroying fungi is the most structurally destructive pest of all organisms that we are confronted with. 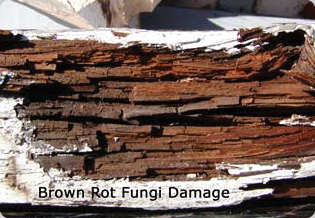 Each year, over $17 billion worth of damage is caused by rot fungi in the United States. Especially in—but not limited to—western Oregon and Washington, rot fungi causes more damage than all other pests combined. 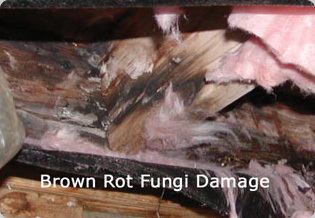 Poria incrassata: Water-conducting fungi, needs a source of moisture (wet ground contact, plumbing or roof leak, etc.) to become established, damage can be greater in sound wood some distance from the moisture source. This pathogen spreads very rapidly and damage can occur in a matter of weeks or months from the initial establishment of the fungi. Substructure: Proper and adequate ventilation of the crawl space, installation of a six mil black polyethylene vapor barrier atop the entire subarea grade, installation of a system to remove excessive moisture (standing water) from the crawl space, repairing plumbing leaks. Interior: Repairing plumbing leaks and roof leaks, ensuring adequate ventilation in the attic, kitchen, bathroom, and other moisture generating areas of the structure. Exterior: Sealing uninfected wood thoroughly with a high-quality paint or waterproofing material, caulking/sealing to prevent moisture intrusion into or behind siding material, ensuring that roof drainage systems are working properly. In all cases, wood that is damaged from wood destroying fungi must be removed to prevent the spread of damage. Reducing the ambient humidity or moisture content of rot damaged wood will not restore its structural integrity or original load-bearing strength. Scabbing new wood onto rot damaged wood will simply allow the existing fungi and damage to spread into the new wood. In cases where limited infection from fungi in its early stages has occurred (where damage has not yet taken place), wood can be professionally treated with a fungicide containing the active ingredient disodium octoborate tetrahydrate to kill the fungi before damage takes place. The above preventative measures can also be applied to non-wood destroying molds and mildews that also frequent structures in the Northwest. With over 44 years of pest management experience, Leupitz Pest Control can provide expert advice and solutions to your wood destroying fungi problems.